What sets the Nokia X apart from the other family members is it simply runs on Android but with a lot of tweaks. The operating system has been customised well so as to keep a similar look with what we see in other Nokia Lumia devices. The Nokia X is actually a mashup as it pulls in elements from the Windows Phone and Asha to create a whole new level of experience. Though it runs on Android, it isn’t fully one. It’s more like the new OS has used the base of the Android OS to bring out something new. If it runs on the Android OS, its normal to think that the apps would also be downloaded from the Google App Store. Unfortunately, it seems that all the applications will have to be downloaded from Nokia’s own customized app store. If the particular app isn’t availble there, it would then link the user to Russia’s Yandex app store. The Nokia X comes in three varieties. First, the standard Nokia X is a mid-range device which sports a 4-inch display with 800 x 480 resolution, armed with a 1GHz Snapdragon processor and a low 3-megapixel camera. The Nokia X+ has the same specs but with more storage and a microSD card slot. Nokia XL is the big brother of the two as it comes with a 5-inch display and a 5-megapixel camera at the rear with a 2.1 front facing camera. 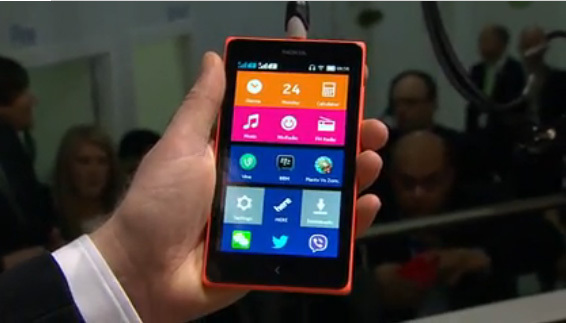 The Nokia X smartphone looks quite similar to the Lumia 520 if you would put it side by side. The only difference is the OS that it runs on. We did expect an Android version but did not anticipate the one that has been released. What’s more interesting is that the users would be using Microsoft’s One Drive for cloud storage and not Google Drive. As the focus group for the Nokia X devices is the growing markets, this is the perfect phone for them to have an unique experience. The Nokia X will be available for €89, Nokia X+ for €99 and the Nokia XL for € 109 and would come in bright green, bright red, cyan, yellow, black and white.